Forgotten ground.. | Through the seasons before us.. I have to say, for me, Derby can have him. I was born the year we won the second European Cup so I can’t recall the feeling of being European Champions like some of the older fans can, however there are a lot of the City Ground faithfull who wouldn’t welcome a PT memorial at Forest. I started going to games with my Dad when I was about 12 and Taylor had only recently passed away, and I can’t say the feeling towards him around me was very good. My old man hated him. He passed away himself a couple of years ago so I can’t ask his opinion now, but it was mainly based on the fact (I have no idea if it is a fact actually, but seems to be what a fair few of the old boys still think) that Cloughie had sorted him out a generous retirement package only for PT to completely screw him and Forest over by going back to the sheep. To all my Dad’s friends that I still see every week at the match, that is still an unforgivable slight and they’d hate to see any memorial to him at the CG. It would only serve to be a reminder that the feelings and the experiences of the older fans have been forgotten. I’m obviously biased because I’ve well and truly inherited this perhaps strong repulsion for the memory of the man from my Dad, but I do think there’s a massive case for not just pulling him out of the history books as we want to remember him, like they’re trying to do at Derby with this statue, and for listening to those who were there and looking at things through their eyes. Thanks for your thoughts, Steve. You’re definitely not alone in those feelings so perhaps it is best that such notions are left to lie. I’m a wee bit younger than you so hadn’t really experienced some of that residual hurt and negativity before. As I say, it’s a grudge I inherited to be honest but a lot of the old boys up in the BC upper around me really do feel the same. I think if you look back without understanding how people felt at the time sometimes you get quite an airbrushed version of what happened. Fair point if that is true but we’ll probably never know for sure. What we do know is that Forest were kings of Europe for 2 years & enjoyed a period of unbridled success under Clough & Taylor, so maybe that should take precedent. Further to that Robbo played an integral part in the two falling out, but for my money he’s still the greatest Tricky of all time. I’m just about old enough to remember those days & just think we should rise above petty money sqabbles. Clough was/is a legend but he himself liked to cut a deal did he not? Anyway lets not let money cloud our judgement/memories- Clough would say just let the football do the talking!! 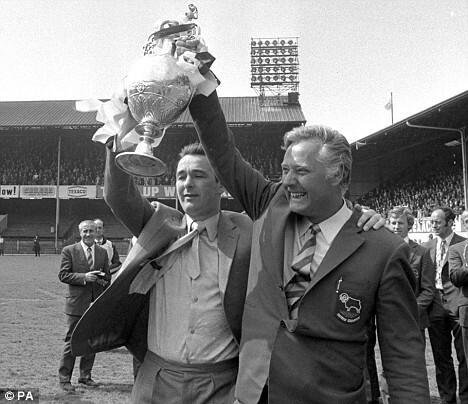 Brian Clough & Peter Taylor!